Street view of homes that were swept from their foundations along West 26th Street, where some of the most intense damage occurred. □ Despite being the deadliest and most destructive tornado in recent history, the Joplin tornado’s awesome strength is sometimes overlooked. 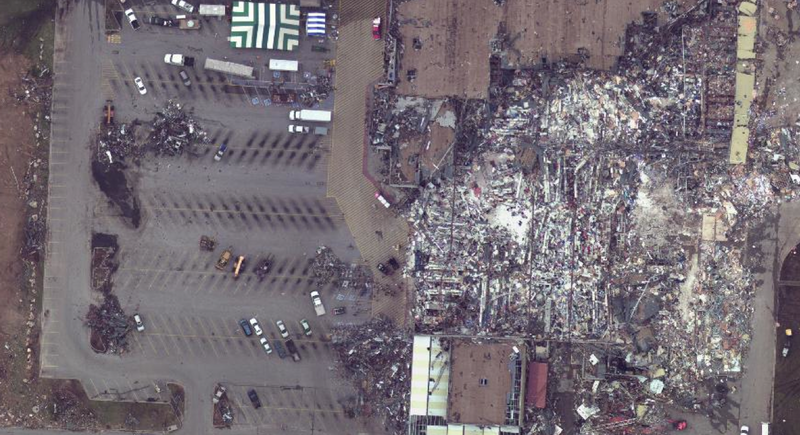 A google search of “Joplin tornado damage” reveals pages of media imagery showing building damage consistent with a tornado of EF3 or low-end EF4 intensity. 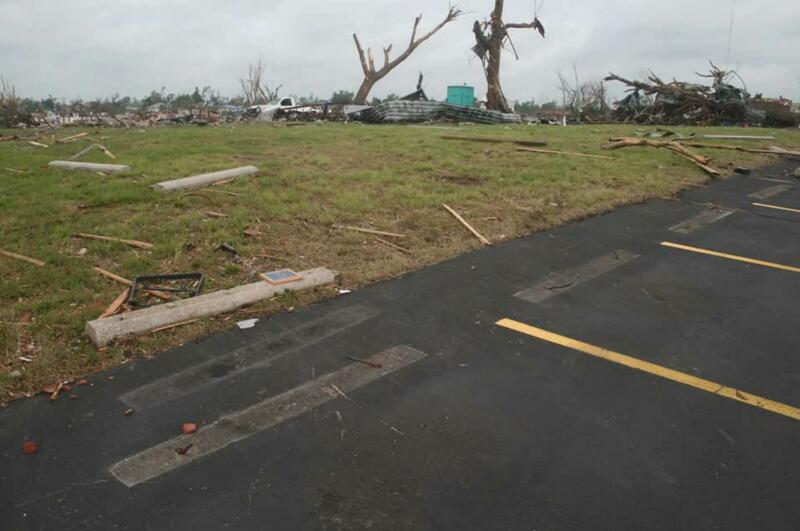 Many online weather enthusiasts have pondered over the veracity of the EF5 rating, and some researchers have stated that there appeared to be few instances of EF5 damage in the tornado’s aftermath. This, I believe, is far from accurate. Firstly, newspapers and news websites have a history of ignoring photographs of EF5 damage in favor of weaker, yet more commonly recognizable damage. Damage in the EF3 range tends to be the media standard. A partially leveled home looks more insidious to the average person than a clean foundation. 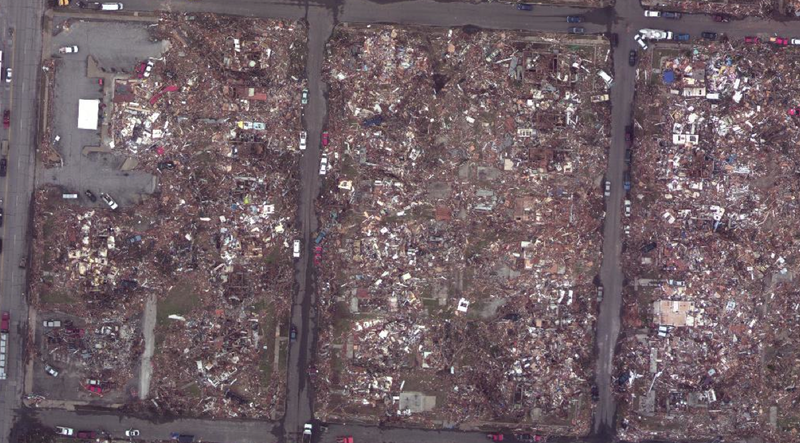 The Joplin tornado left more empty slabs than perhaps any tornado in history. The Enhanced Fujita Scale puts great emphasis on homes of superior construction, so a concrete slab is not an obvious indication of EF5 winds. Considering the incredible density of the buildings in Joplin, however, the volume of clean foundations was rather impressive. 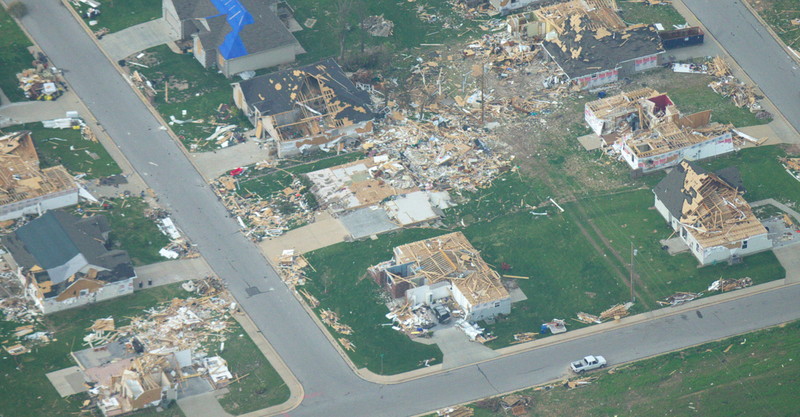 Note: Most of the close aerial shots were taken more than a week after the tornado, so some damage clean-up had already taken place. 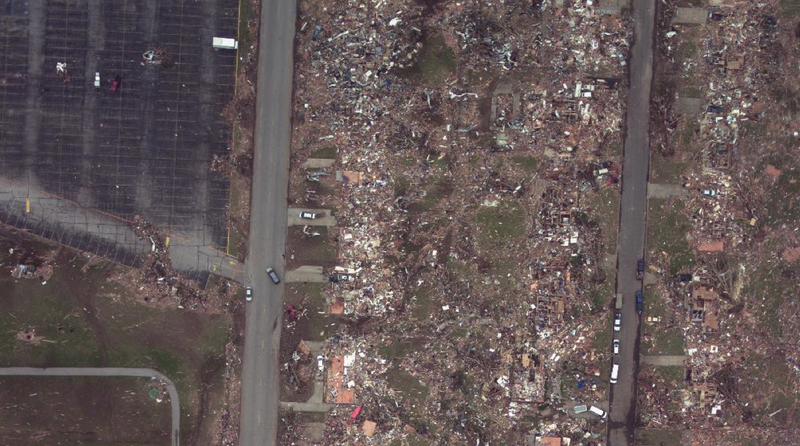 Geodetic survey images that were taken immediately after the tornado have been included to verify that the homes were swept away by the tornado, and not bulldozers. Click each image to enlarge. 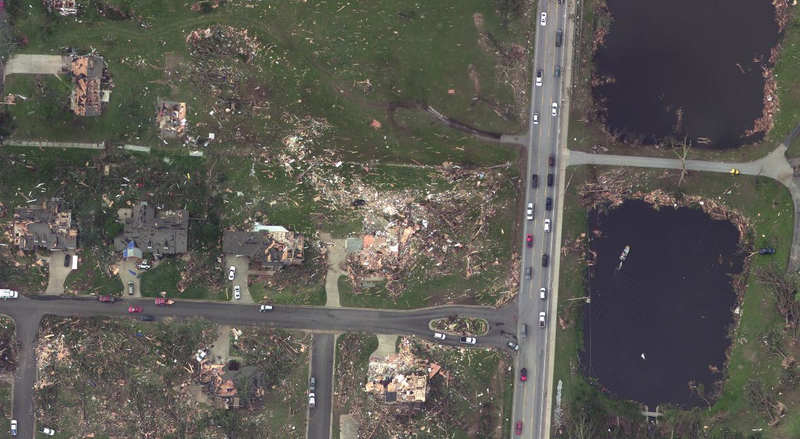 The Joplin tornado was narrow and rapidly intensifying as it passed over homes near Sunset Drive. One large home, of unknown construction, was swept completely away while neighboring homes remained comparatively untouched. Damage in this picture indicates the presence of a suction vortex that may have travelled from bottom left to top right. Will Norton, whose online notoriety garnered significant media attention, was one of the first victims of the tornado. His Hummer H3 was overtaken as he was driving south on Shifferdecker Avenue, about a half mile west of St. Johns Hospital. Despite wearing his seatbelt, he was ejected from the vehicle and later found dead in the pond at lower right. The tornado was widening and likely at peak intensity as it travelled down West 26th Street, moments after St Johns Hospital was gutted and effectively “destroyed”. A row of homes was swept away near a walking path. The highest concentration of fatalities throughout the tornado’s path occurred in a half mile stretch in this area. View of the same area along West 26th Street. 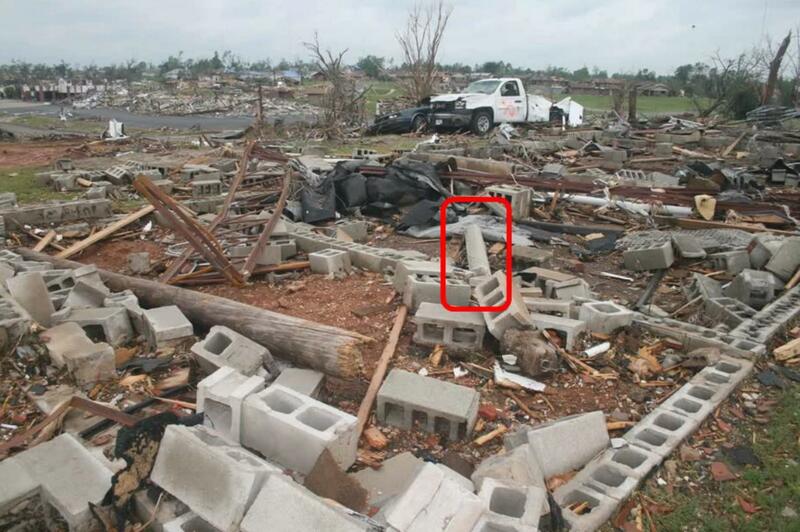 This image was taken the day after the tornado and shows the same empty foundations before any clean up had commenced. Heavy vehicles were thrown into some of the exposed basements. View of damage along 20th Avenue, immediately northeast of St. Johns Hospital. 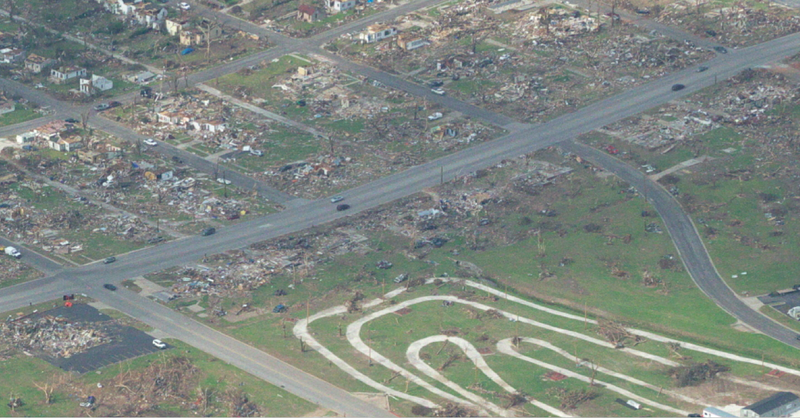 The few remaining trees and shrubs in the foreground were completely debarked, a damage indicator unique to EF5 tornadoes. 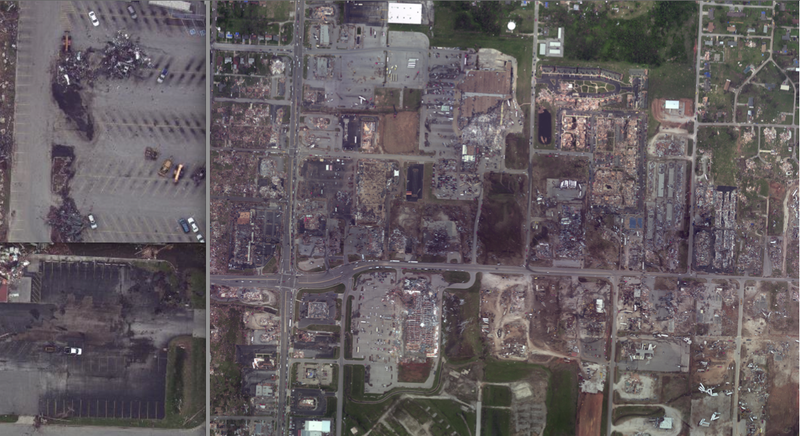 Vegetation damage in Joplin was noticeably more intense then that caused by the 2007 Greensburg tornado and many other storms given F5 ratings pre-2007. At extreme bottom left is the tractor trailer shown in the next image. The Greenbriar Nursing Home was a large, brick complex (at center) that was leveled and partially swept away. Of the approximately 90 residents and staff that were huddled in the building, 21 were killed. It was the highest tornado-related death toll in a single building since 1987, when 22 were killed at a school ceremony in Saragosa, Texas. View of the Greenbriar nursing home before the tornado. 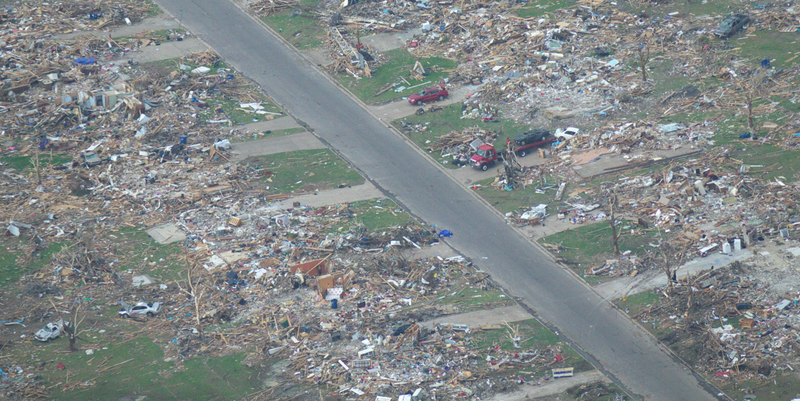 Entire blocks of two-story homes were completely flattened as the tornado crossed Main Street. Taking into consideration the density of the structures, damage of this intensity is rare and an indication of incredible intensity. Manhole covers weighing in excess of 100lbs were ripped from the ground. Partha Sarkar concluded that winds in excess of 200mph were required to remove the well-sealed covers from the streets (Joplin Globe, 2011). 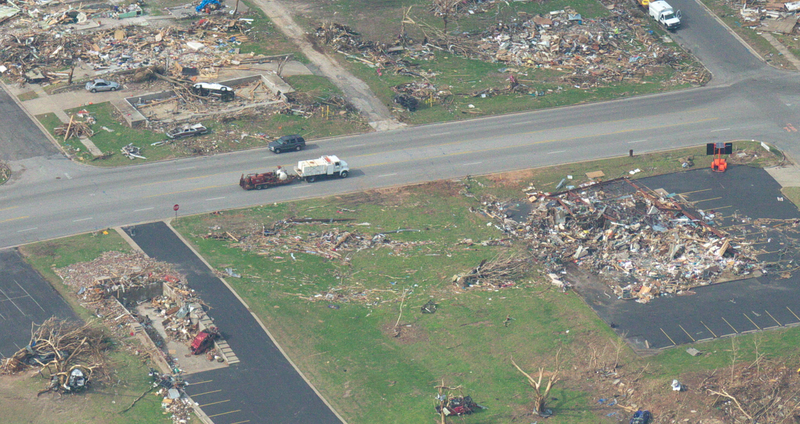 As the tornado approached Joplin High School, homes along Missouri Avenue were leveled or swept away. While the tornado likely maintained EF5 intensity from just northwest of St. Johns Hospital to a half mile east of Rangeline Road, the most extreme damage occurred in two distinct peaks near the beginning and end of the EF5 contour. The tornado was near the end of its primary peak in intensity as it crossed neighborhoods to the west of Joplin High School. Homes along Iowa Avenue were swept away in EF5 fashion. Mark Lindquist, later dubbed the “miracle survivor”, was thrown several hundred yards from a home in this area. Lindquist made it out alive, but the three men he tried to protect did not. 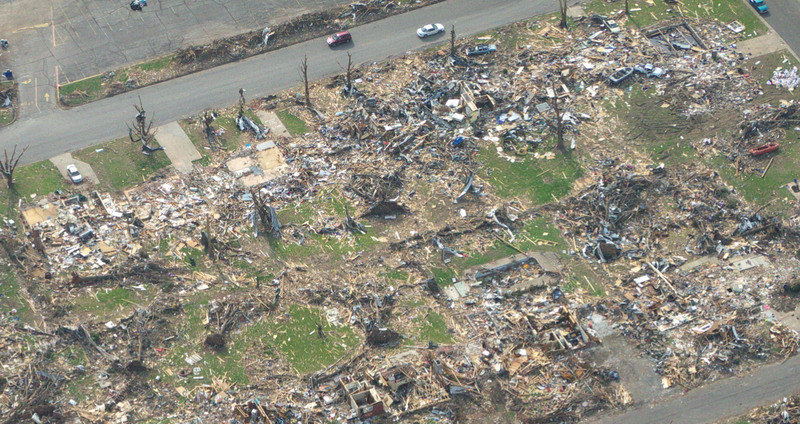 Image of Iowa and Missouri Avenue the day after the tornado. The four foundations in the previous picture can be seen adjacent to the baseball field. Light poles and steel fence posts were bent to the ground in the athletic fields. Homes were swept from their foundations on both sides of Joplin High School. The center of the tornado crossed the school’s athletic fields and entered a residential area bound by Indiana Avenue. High velocity projectiles left gouge marks in grass lawns. Probable EF5 damage along Indiana Avenue. Rows of homes were reduced to their floorboards. 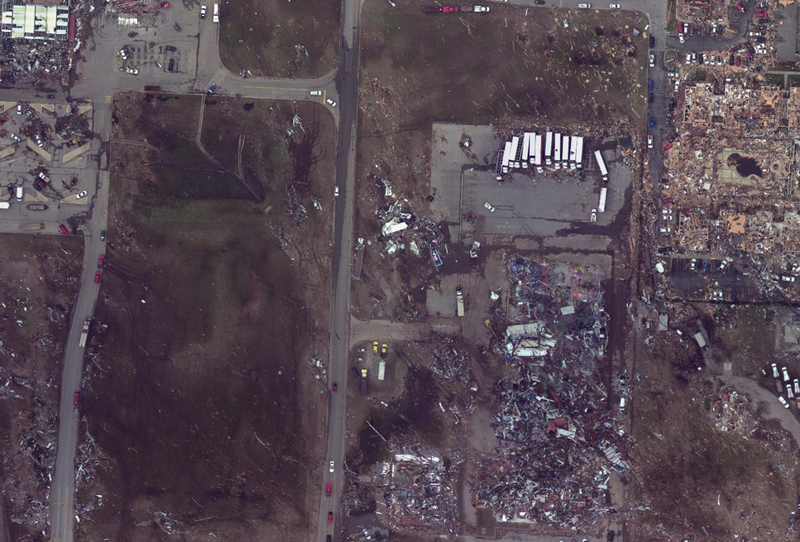 The death toll of 158 people made the Joplin event by far the deadliest tornado of the weather-radar age. Had the tornado occurred after dark a few hours later, the death toll would have been much higher. Research has shown that, on average, tornadoes that occur during daylight hours cause only 64% of the fatalities expected from nighttime tornadoes, assuming all other variables are controlled. Therefore, it is likely the tornado would have caused 250 to 270 deaths had it taken place later in the day (Stimers and Paul, 2011). 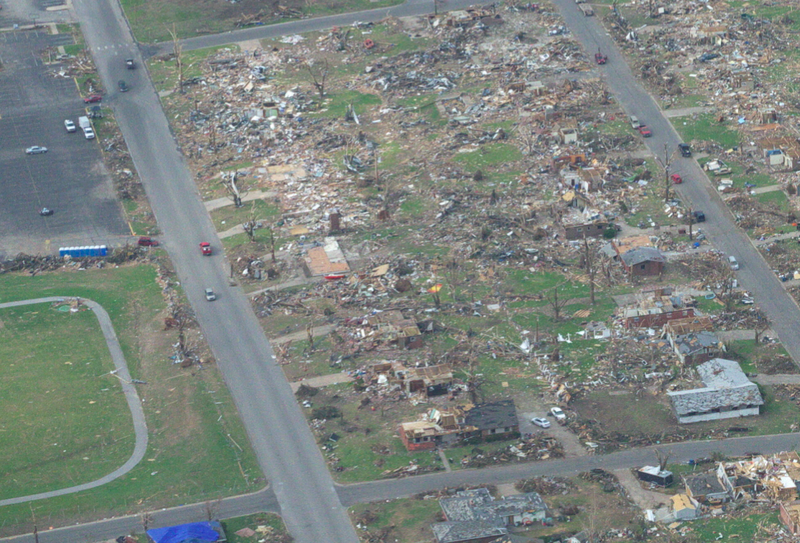 Aerial view of Indiana and Illinois Avenue the day after the tornado. The empty foundations visible in the previous photograph are evident. Homes were swept away on both sides of Montana Place, and the few remaining trees were debarked. The immense blizzard of high speed debris within the tornado made survival difficult for those not in reinforced concrete shelters. The tornado may have reached a secondary wind maxima as it crossed Rangeline Road. 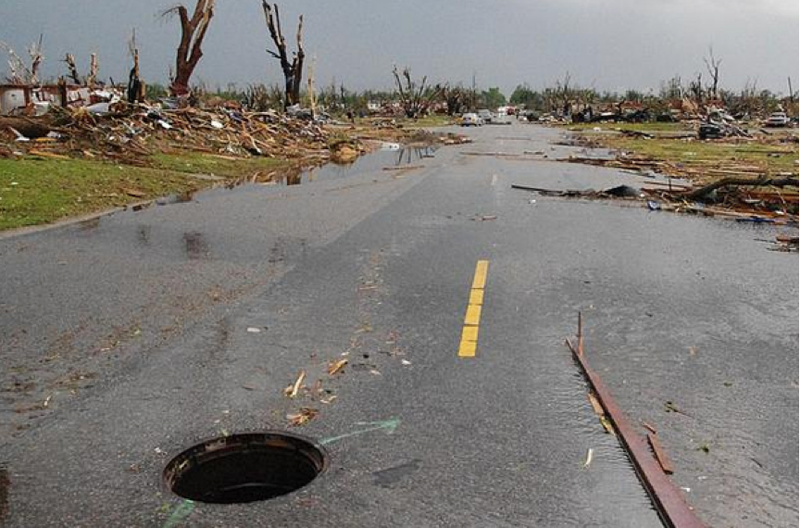 A large swath of wind damaged grass marked the path of the tornado’s inner core. At top left, view of scoured pavement in the Walmart parking lot. At bottom left, view of scoured pavement in the parking lot of Pizza By Stout, which was located just west of Home Depot. Extreme surface winds partially scoured fields of grass behind Pizza Hut, where five people were killed after taking shelter in a walk-in freezer. The inner core of the tornado skirted between Home Depot and Walmart, but both stores likely experienced EF4+ winds as suction vortices rotated around the center of the storm. Eight people were killed in Home Depot, and three at Walmart. Another view of the devastated Walmart. A dark patch marks where pavement was scoured from the parking lot (left center). The scouring commenced at the base of an uprooted tree. A suction vortex traveling from east to west may have passed through the center of the store, leveling much of the structure to the ground. Just east of Rangeline Road, warehouses were left as bare slabs, and large industrial vehicles were hurled more than 400 yards. 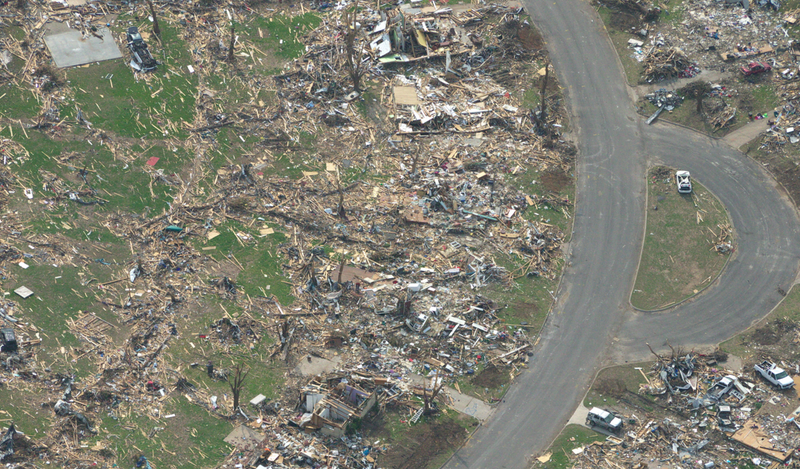 At far right, the tornado left a trail of scoured vegetation and pronounced wind rowing. The Joplin tornado was an incredible meteorological phenomena. Unlike some infamous EF5’s, the Joplin tornado was rain-wrapped and not clearly documented on film. Additionally, it had a fairly short path length – less than 25 miles. 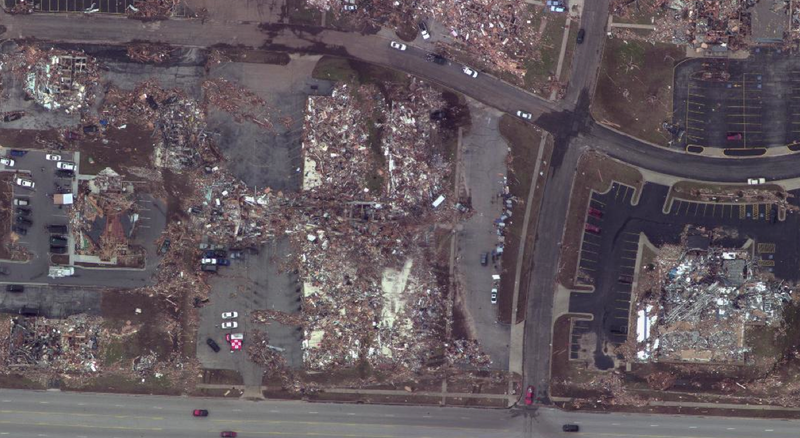 Even so, the Joplin storm was one of the most powerful tornadoes ever surveyed, and likely caused the most intense tornado damage ever photographed in an urban area. Video evidence, which is discussed more in depth here, indicates that the massive tornado had exceptionally powerful multiple vortices. It is likely that most of the extreme damage occurred in only a few seconds as a result of brief wind features with instantaneous gusts over 250mph. Engineers found evidence of winds of at least 205mph only inches above the surface, a remarkable figure considering the density of structures and the dramatic slowing effect of ground friction. A derecho in 2009 passed directly over Joplin at peak intensity. Some gusts were estimated to have reached 115mph, yet nearly every home in Joplin experienced minor to no damage. I appreciate their research into the faulty construction techniques common in US housing, but to believe most of that damage was caused by winds of 135mph or less is, well, ridiculous. The main point, I believe, is that it is near impossible to find a home that engineers deem to be well-constructed. I don’t think they mean to imply the winds didn’t surpass 200mph, only that (according to them) there are very, very few structures capable of indicating winds above that intensity. Other research papers have shown that it generally takes winds in excess of 180mph to lift cars at less sensitive angles. Considering hundreds of cars were hurled more than 200 yards and mangled beyond recognition, I feel it’s safe to say winds were well over 200mph over a large area. That sounds like something of a flaw in the Enhanced Fujita scale compared with the original in that it may have set construction standards a bit too high, considering that it was already difficult to distinguish between F4 and F5 damage. 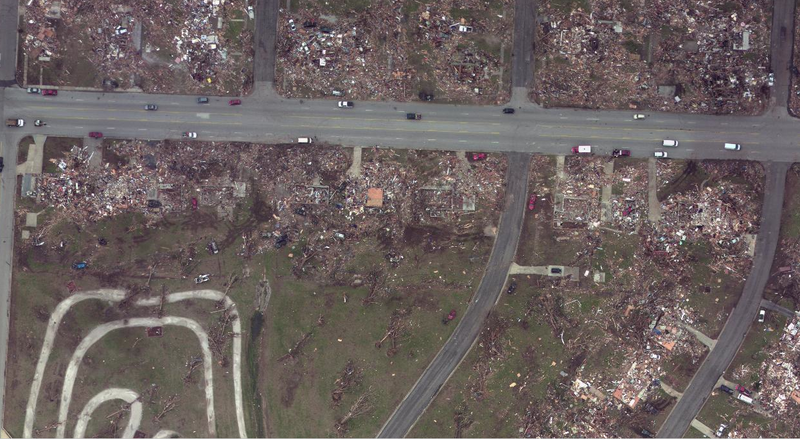 I think the Joplin tornado was a high-end EF-5 & if measurements had been taken at its peak, it probably would have shown 250mph+ windspeeds at or near the surface. It was a massive tornado, so big it was almost like the storm system itself lowered to the ground to plow up the town. I am always amazed at how pitch black it made the sky. The radar hook echos for this tornado are frightening. Very pronounced. As the tornado moved through, trucks and cars on I-44 to the south were blown off the road, the gusts were amazing. Very high precip tornado, large wedge, not well defined, and EF-5 winds. Plus hitting a populated area on a Sunday evening. No wonder so many died. Every time I watch a video of the Joplin tornado (they are rare due to the high precip) the blackness & the power of the inflow and gusts around the main funnel amaze me. Definately one of the most potent storms in the last 100 years. Regarding the the American Society of Civil Engineers claim that the tornado’s winds might have reached EF-5 strength but that the worst damage done was EF-4, I think this is iffy at best. They claim that the weak nature of the structures in Joplin led them to conclude this. I’m not sure about this personally. I feel better about meteorologists doing the assessing of tornadoes and their damage. I haven’t ever been to Joplin but based on the horrific pictures taken after the tornado, the entire town look flattened as if by a nuclear bomb, with only the hospital still standing. I seriously doubt Joplin was lower than EF-5. This tornado had an intense mesocyclone, probably one of the most intense ever in recent history, and amazingly rapid strengthening. It went to EF-4/EF-5 status in literally minutes. 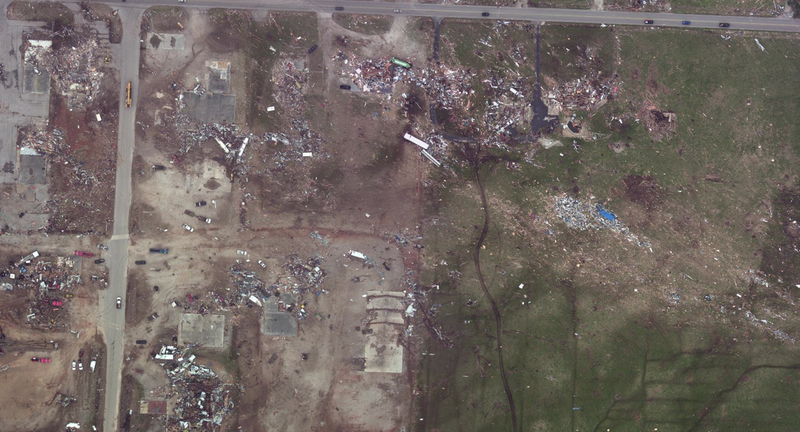 I still think the Joplin tornado’s core winds were solidly EF-5, well over 200mph, probably 220-250 max. Watch the video taken by chaser Jeff Pitrowski & it’s clear this tornado was extremely violent. So are the engineers claiming that the winds aloft in the tornado might have been EF-5 but the surface winds were only EF-4? I don’t get it. But yeah, I still think based on the damage, it was a solid EF-5 and the NWS won’t change the rating. The NWS claimed only a slither of damage was EF-5 but their own map of the tornado’s intensity shows a solid line of EF-5 damage? So what gives? Oh yeah, and extremeplanet, how do you think the Joplin tornado compares to 2013 Moore storm? More or less intense? I think, as the person who runs this site seemed to imply, the article claiming no EF5 damage did not mean to say that the tornado didn’t reach EF5 intensity, but rather than none of the structures that were destroyed were sturdy enough to yield an EF5 rating even if they were impacted by EF5 winds. 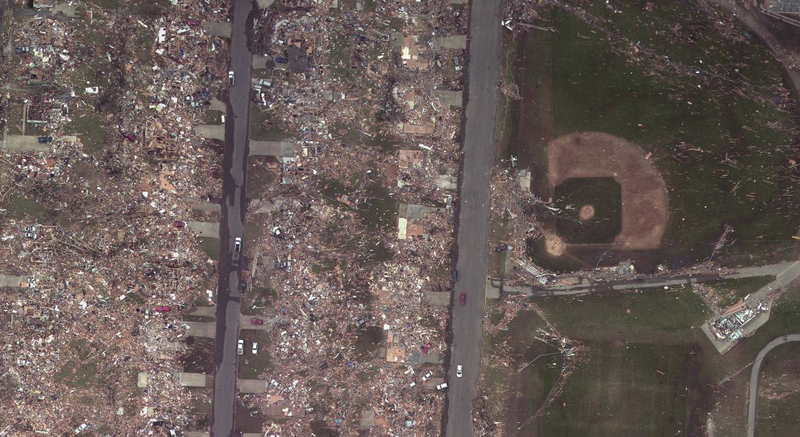 How many homes were there in the Joplin tornado that received EF5 damage? I know the Bridge Creek/Moore/OKC tornado did like E/F5 damage to like 17 homes as well as the Parkersburg/New Hartford tornado also did EF5 damage to 17 homes. The Greensburg tornado only did EF5 damage to maybe 4-6 homes. What is the most homes to receive E/F5 damage in an E/F5 rated event? I’m not sure how many homes were determined to have experienced EF5 damage in Joplin. The answer might be none due to the strictness of the EF-Scale. More than 100 homes were swept from their foundations – leaving only the floorboards or, in more extreme cases, the bare foundation or underlying basement. Most of this damage occurred just east of St. Johns when the tornado was peaking in strength. I’m not sure what tornadoes caused the most instances of E/F5 damage partially because the F-Scale was more liberal than the EF-Scale. If I was to take a guess, I’d say Hackleburg/Phil Campbell tornado caused at least 25 instances of certifiable EF5 damage from Hackleburg to Mount Hope. In terms of the maximum number of homes swept away (regardless of whether it was deemed to be of “superior” construction), I’d say either Joplin or Hackleburg.